Answer 1: The people must be better informed in world affairs before voting on involvement and without giving our hand away, be kept in the loop. Cut the military to a “surgical staff” which is supported by civilian contractors will increase competitiveness and transparency. Demographic analysis indicates we have enough money to pay for SS and Medicare, et al. The “fire sale” of 2008 was a money laundering scheme transferring ownership and profits to foreign corporations. We must close that gate, then increase global market penetration. Let’s bring manufacturing into the 21st century and provide everything, everywhere and bring “our” money home. Freeman, 56, lives in Fairborn and works as a consultant to small business. She said she has worked in software sales, as a corporate recruiter and as a substitute teacher. 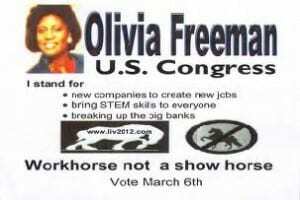 She ran unsuccessfully in the 2010 Congressional primary for the 7th district. Freeman also called for the use of “simulation technology” in education to better prepare students in science curriculums. She is in favor of getting American troops out of Afghanistan, and said she does not believe in cutting entitlement programs, saying once the Baby Boomer wave is past, the programs will be sound again. She said her business experience has prepared her for a bipartisan approach. Olivia ran in 2010 in the OH-7th and had a leftover site that’s a bit odd- which she’s updated, and may be using signs from that run. Her tagline is a bit odd from an ad standpoint- “A workhorse, not a showhorse” as if this is a horse race instead of an election. She’s missed a few candidates nights and has some literature that showed up about the same time McMasters lit showed up (both a few weeks after mine was already out). Today, while I was distributing literature at churches I hit one church right after Olivia had- I took a picture of her lit under a winsdhield- my mother thought it looked like a parking ticket. When you watch the videos of Olivia speaking you’ll hear the same thing for the most part- about her age and military experience- she went into the Army in 1973 making her a Vietnam era vet, however she didn’t serve there. You’ll hear she went to Wright State as did her daughter- who she’s quite proud of, who wasn’t supposed to do drugs or have babies (so far so good) and then she’s off on her idea of solving problems by begging corporate America’s foundations out of charitable cash to solve the problems in our community. Next Gen is broken into four business units: Solas Construction helps people get training and experience in the construction industry. We manufacture our own solar power generator providing training and job experience to market disadvantaged and the underemployed. Freeman Educational Engineering, uses simulation technologies and engineering principles to enhance outcomes. Next Gen Communications: still produces software and added products for disaster preparedness. Next Gen Pharmacom: provides jobs in the pharmaceutical and aquaculture industries. Brought professional recruiting practices to hospital. Sourced candidates, wrote protocol for recruitment standards, methods and metrics. Created and presented career development courses to ensure captive audience of candidates. Designed employer branding, arranged logistics beyond job fairs. Streamlined application and interview process. Created first HRIS system for hospital. Rated “Excellent” in customer relations and employee advocacy. Sold over one million dollars in mainframe data encryption software. Developed strategic plan to increase market penetration. Trained sales staff. Taught world-class relationship building. Trade Show Diva. Always came back with great leads. Still hold record for largest single sale. I’ve heard her speak enough times that I should know what her plans are for Congress- but, I’m still feeling like I’ve not heard anything substantive. You should wish you spoke like Olivia. Everyone else in the room is always impressed because she hits the right mix of energy and substance for the everyday person. In fact, our two radio hosts from Washington CH mention her speaking ability above all the rest of us. This despite the fact that she spoke off the cuff because she was not aware of the event until Ryan told her of it at the screening (obviously she would have benefited from checking your site occasionally). Also, her website rivals yours in both content and layout (and it is viewable on base where yours is blocked – not sure if your campaign site is blocked). Bottom line – Your assessment is tainted by parochialism and not particularly reflective of how most people view her. @Tom McMasters- I don’t know how most people view her, nor did I suggest anything like that- I tried to summarize what I heard at every event so if they didn’t have time to watch all the videos, they’d know what they contained. Yep- Olivia is a charmer and speaks well. I like Olivia, in fact, I like all the candidates. I’m just trying to gain share insight and give people an opportunity to make their own decisions and discuss things here in the open. Thanks for your comment.